Nikon photo enthusiasts looking for a series of free podcasts designed to enhance their image making skills have a new "must listen" resource. The first podcast in the new Nikonians Photo Professors podcast series debuts this week, hosted by Rick Paul and Rick Hulbert. Their free podcast is ready for direct download and it is also available in the podcast section of the Apple iTunes store (also free). 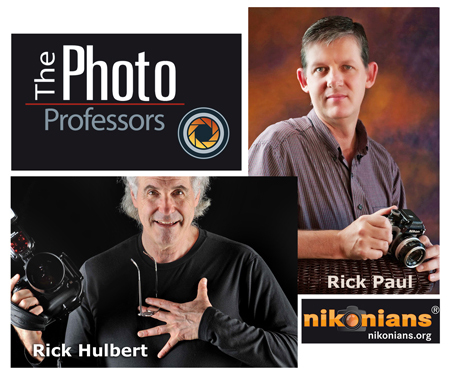 Nikonians Photo Professors Rick Paul and Rick Hulbert combine 60 years of professional and successful photography experience in the newest podcast series available through nikonians.org starting January 15th. Rick Paul has supplemented his 25-year career as an Aerospace Engineer by creating and developing a successful wedding photography and portrait photography business in addition to his success as a stock photographer. Rick has honed his instructional skills teaching photography skills to company factory workers. Rick Hulbert has leveraged his 35-year background in architecture and urban design as a springboard for his current activities as an instructor and lecturer and workshop leader in the areas of architectural, travel, street and urban photography. The Nikonians Photo Professors credit Jason Odell and Rick Walker, longtime podcast veterans of more than 150 Nikonians Image Doctors episodes for their inaugural work in generating interest in the field of photography-oriented podcasts. While preparing for the debut episode they consulted with Jason Odell and arranged to book him as their first guest. The professors pay homage to the Nikonians motto: Share, Learn, Inspire by structuring the podcast format to those three elements. Each monthly episode will share information on new gear, assist in learning with the help of special guests and inspire creative techniques with an emphasis on basics (meaning no need for purchasing new equipment). and individually at rickpaul@photoprofessors.org or rickhulbert@photoprofessors.org. You can follow podcast show notes and background information at the Nikonians Photo Professors blog page.